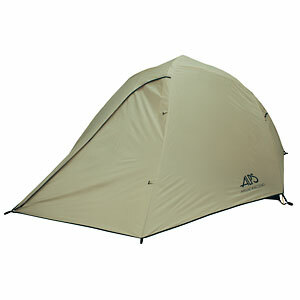 Packed Size	 8" x 24"
This tent is a bit heavier that the Extreme 3 having a thicker floor and wider zippers. These are an added bonus adding weather protection in extreme conditions. 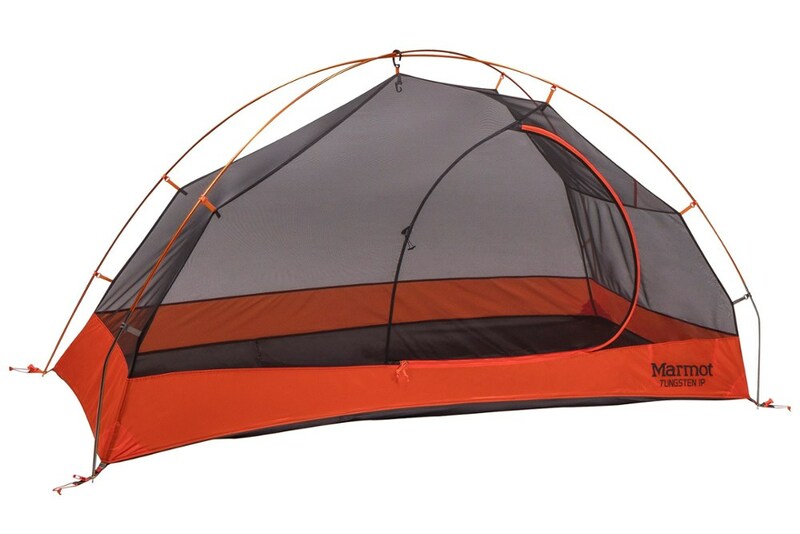 The tent is still relatively lightweight and offers excellent protection from the rain and wind. 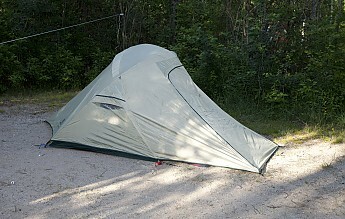 This is a very well designed tent overall; lightweight but not flimsy, easy to put up and take down. When the tent is completely setup, the floor is solidly on the ground with six stakes and will withstood wind gusts up to 35-45 mph. The tent has kept me dry in severe downpours that raged for 2-4 hours and in steady but slow rain that came down continuously for 8 hours. The tent gets 4 stars because the nylon tafetta material used to construct the tent is showing two or three tiny signs of fraying after about a dozen times out. Having said that, all tents, in my limited experience with three, have to be treated with tender care given and handled with an extra touch of love to survive. 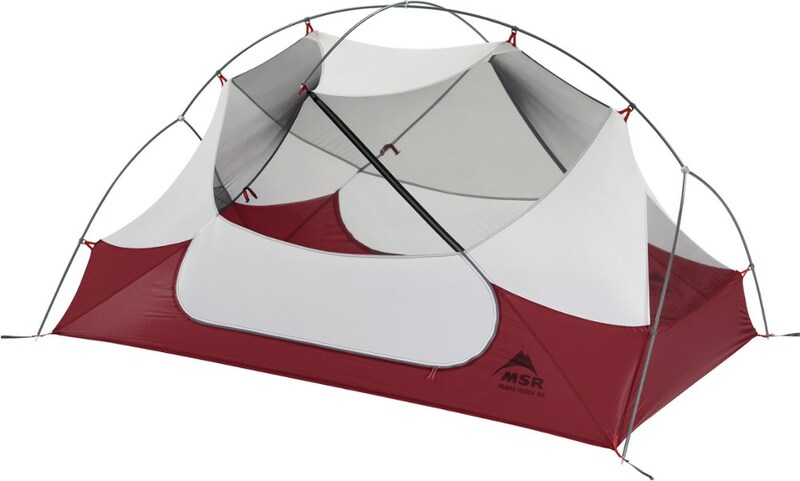 The beauty of this tent's design is in the way that all of the parts, some of which may be slight in appearance, when put together, make for an overall power house of strength and rigidity. 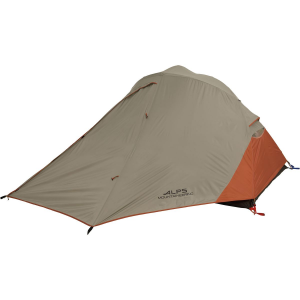 The Alps Mountaineering gear in general is of very good quality and the Extreme 3 tent maintains the high standards . A close inspection of the parts of the tent reveals unique features that allow the tent to be assembled easily, keeping it lightweight but very strong. The aluminum poles are constructed in such a manner that they almost snap themselves together. 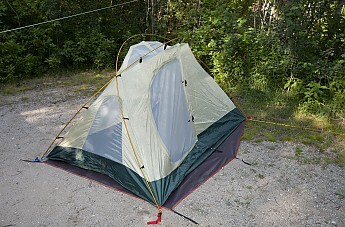 Strapping the sturdy clips to them is a cinch and in less than 20 minutes, the tent is staked into the ground. Catching on to the crossover pattern for the poles to clip to the tent is a bit of a mystery however, especially since the manual gives no clues to this pattern. 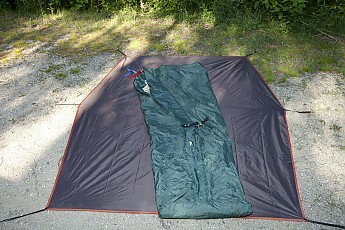 Only by closely studying the photo on the Alps Mountaineer website was I able to erect the tent at home. After two more practice sessions out in the field, I am now an expert on knowing which direction to thread the poles. The poles are very capable of imparting a great deal of rigidity to the body of the tent and as mentioned have withstood high wind volumes and speeds. I felt very secure in rainstorms and heavy winds for three nights of heavy weather while camping recently at LeeLenau State Park near Northport, Michigan. 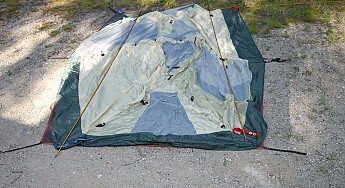 The floor of the tent is sufficiently heavy to keep out all moisture and resist puncture. I still recommend the use of the dedicated Alps Mountaineer footprint, specifically cut to dimensions that are roughly 2% smaller than the floor of the tent. This keeps the footprint well under the edge of the tent to allow rain fall to soak into the ground that directly falls off the edge of the tent while sill protecting the underside from moisture, soil and sharp objects. 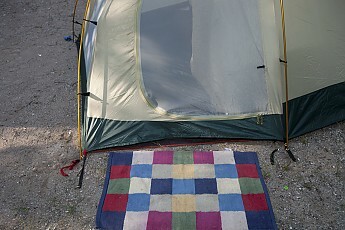 The technology used in making the footprint is of the same kind as the tent and the rainfly; it magically sheds water from the underside which pushes the moisture that might be flowing from the ground back down into the ground instead of leaking upwards to the floor of the tent while at the same time preventing water from puddling under the tent floor. Generally, the idea is that the footprint works in reverse direction of the rainfly -to keep a water barrier between the ground and the tent floor but not allowing water to collect. The tent floor itself is very waterproof so no rain will reach the footprint from above since it safely embedded under the floor and well away from the edges. More evidence of the miracle nature of fabrics is exhibited in the body of the tent. 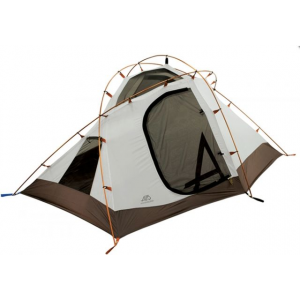 Again a lightweight nature prevails; this is an outfitter tent designed for rugged settings so it is not the lightest of tents overall weighing in at 8 lbs 12 ounces including the fly, poles and fly, not included in that weight are the needed hold down stakes. Most of the extra weight comes in at the floor and zippers which are heavy duty but that is the beauty of this design for me. I camp out of the back of the car so I’m not too greatly concerned about weight issues having the ability to carry the passenger capacity of the Chevy Cobalt which is about an additional 400-450 lbs beyond my own chunky poundage. I am currently packing about 110 lbs of gear so I can appreciate the benefits of a heavier tent which includes added thermal protection. The tent material is made of breathable 70 D (a weight/strength rating) Nylon Tafetta which in conjunction with the rainfly not only keeps the interior of the tent dry but actually allows evaporation to the outside to occur, even in wet conditions. Granted, under heavy rainfall this is not occurring but I actually experienced the drying effect when some jackets and a sleeping bag, inadvertently left out, got wet during a light, consistent all day drizzle while camping at Sleeping Bear Dunes in the Platte river campground. Distressed at the wet nature of the materials, I tossed them inside the Alps Mountaineer Extreme 3 Outfitter and came back 5 hours later to discover that they were dry and usable. This shows that the interior of the tent successfully sheds moisture while passing moving air into the tent in a dyer state and allowing air to evoke evaporation to then occur inside the tent. 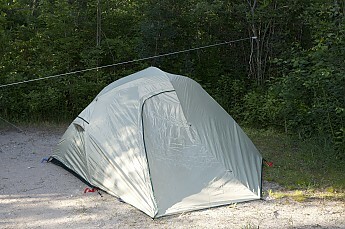 Oddly, during very still nights when the wind is at zero and heavy condensation occurs outside; this effect just mentioned is minimalized but the very heavy dews experienced recently at MacGregor Point, Port Elgin, Ontario, near the shores of Lake Huron, proved again that the tent is one of excellent design in keeping the folk inside the tent warm and dry. The tent could be used without the rainfly for those who want an open experience and the roof of the tent as a see-through sky light for a neat ambiance and nice effect during starry, starry nights-with no heavy dew! I’ve not tried that yet-maybe on my next trip. As just outlined the rainfly is the secret to the waterproof nature of the tent and protected me from heavy several periods of tremendous downpours at LeeLenau State Park in Michigan, some lasting for several hours with intermittent stages of rainfall that can only be visualized as a hosing. The fabric shrugged its shoulders and led the water to the edges of the tent where I was fortunately located above tons of sandy, porous soil. The rainfly has extensions built in that allow it to cover the ground for 2 feet beyond the doors and offers additional storage area for gear. The gear is safe, because the overhead material is direction the falling rain to the edges, so gear does have to be kept back from the edges. Inside the tent, cross ventilation and upward movement of air out of the tent is very good and allows a gentle constant flow of air to maintain a fresh sensation. 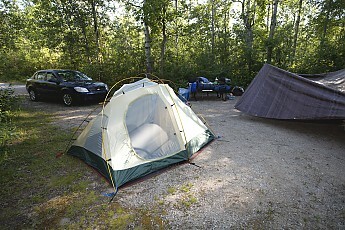 The two doorways to the tent would be a bonus if there are three occupants. The doorways are a bit of a struggle for a six footer to use in gaining entry but here again the easy flow zippers work great. Air flow through the doorways can be adjusted with an inner layer that zips away to the side to allow the no-see-um screen full access to the air flow. 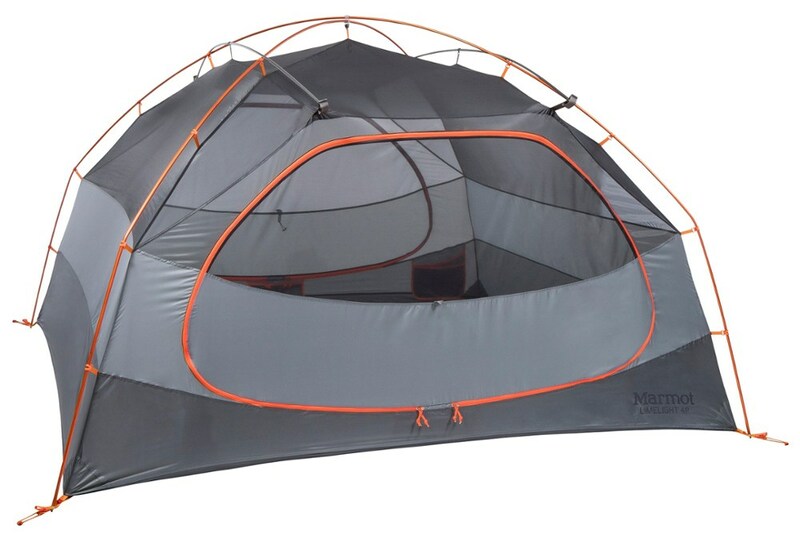 So in summary, this tent offers safe, snug, warm, dry protection for three (or two large) adults during the three seasons of Spring, Summer and Fall. Its cost, a bit higher than some but lower than the professional gear, is worthwhile and should not be a barrier to anyone who might be otherwise hesitating to look at the price range of about $230 -$265 on the street. I can’t imagine finding a better value with looking a very long way. The footprint goes staked out, and the tent unrolled on top of it, next the two longitudinal poles are placed on top of the tent and then the poles clipped to the tent. Fourth photo shows the cross pole now attached to the tent. 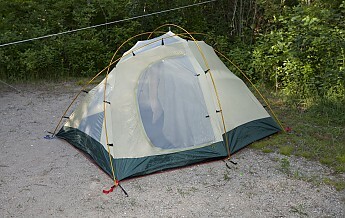 Photo # 5 shows a frontal view of the tent and doorway zipped shut to keep out bugs. #Six shows a closeup of the hefty zippers. A clear shot of the extra room created as a foyer by the extended rainfly. View of the MacGregor Point campsite, at the Grouse's Landing loop. The park has much to offer; however, the beach, about 1/3 of a mile from the tent site, is very rocky. Adds to the picturesque drama though. Exciting landscapes abound. I had a set of very noisy neighbors as they began to party about 10pm, who did not bother me as I sipped wine, gazed at the stars and watched the moon rise. 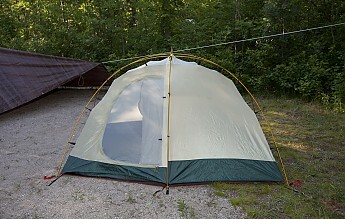 This tent is currently available July 20, 2012, according to Overstock. com website page devoted to it. Raymonde, nice job on the review. Very nice job indeed. Roomy and light, perfect hideout for our canoeing and hiking expeditions. Setup is easy and color coded—very easy to figure out. Especially with symmetrical rain fly and only two poles. Stability is excellent, even in high winds and storms there was minimal sway to the structure. Weathered perfectly—first trip out was 10 days in Northern MN and we received flood-level amounts. When it would rain for 6 hours straight, a small drip would occur in the seam of a zipper, but caking on a little Carmex really helped. Vents very well, even when hanging out in the tent for multiple hours with two adults and a yorkie. I like being able to reach out through the head and foot windows from inside the tent as well. Roomy—I'm 5'7", my husband is 6'4". We sleep on hiking mats and have plenty of room while sleeping where we can store clothing, etc in the tent while sleeping. Husband was able to sit up easily with headroom in center of tent. The shape of vestibules makes storage while coming/going very easy. Welcome to Trailspace, EmV! Thanks for the review. The ALPS Mountaineering Extreme 3 Outfitter is not available from the stores we monitor.